Radio Spirits » Blog Archive » Happy Birthday, Joseph Kearns! In the 1950s, with technological strides being embraced by the dying medium of radio, the Columbia Broadcasting System started using Hammond electric organs for “fill music” on their broadcast programs. The Hammond was smaller and far less expensive, and it would allow CBS to rid itself of a colossal Wurlitzer theatrical organ the network already had on hand, packed away after being purchased from Warner Brothers. The Wurlitzer was headed for the scrapyard…until an actor named Joseph Kearns—born on this date in 1907 in Salt Lake City, Utah—made CBS a cash offer for the instrument. Joe experienced a temporary setback once he remembered that he had no place to put the Wurlitzer—Kearns was a lifelong bachelor who called various studio apartments home. So in the tradition of “if the mountain will not come to Muhammad,” Joe designed a two-and-a-half story house to be built around the enormous organ. With pipes built into the walls, and the console the showpiece of his living room, Joseph was able to indulge himself in one of his favorite hobbies in his downtime, often making the rafters at Chez Kearns ring. If Joseph Sherrard Kearns’ parents had their way, young Joe would have abandoned all those silly notions of show business once he shed childhood. His mother Cordelia was partly to blame; a pianist and organist, she instilled in her son a lifelong love of music (despite the family’s strict Mormon upbringing). But at the age of nine, Joseph was traveling with a kiddie troupe in vaudeville until his parents sent him to a school (for “precocious children”) in San Diego a year later. Kearns would eventually graduate from the University of Utah with a degree in music. Although he continued to fuel the fire of his performing ambitions with part-time work as a motion picture organist, his father (Joseph Albert) insisted that he take a position in the Boston-based wool company that employed the senior Kearns as a buyer. Joe Kearns’ career in the wool business was short and sweet. He purchased $8,000 worth of Karakul wool and shipped it back to the company…only to learn that the wool was black and could not be dyed. Kearns soon left that industry and, with his father’s blessing, found work with a California theatrical company. This first official step in his acting career found him doing what such stock players do best: playing any kind of role, and educating himself in the ways of the theatre. One thing that Joseph learned early on is that leading men may come and go, but the character actors reliably add spice to any play and ensure a production’s success. In addition to developing into a fine character actor, Joseph Kearns had a fine voice that was perfect for the burgeoning medium of radio. His early broadcast days found him performing in all manner of plays for Los Angeles’ KHJ as a member of that station’s stock company. He later moonlighted on any number of transcribed programs from Hollywood studios. One of his well-known jobs from this transcription era was on The Cinnamon Bear, a Yuletide serial that continues to delight listeners today. Joe co-starred as the Crazy Quilt Dragon, alongside a cast of true radio veterans. With the gradual migration of network programs from New York to Hollywood, Joseph never wanted for acting work—appearing on such favorites as Big Town, Dr. Christian, Hollywood Hotel, The Lux Radio Theatre, The Silver Theatre, and White Fires of Inspiration. 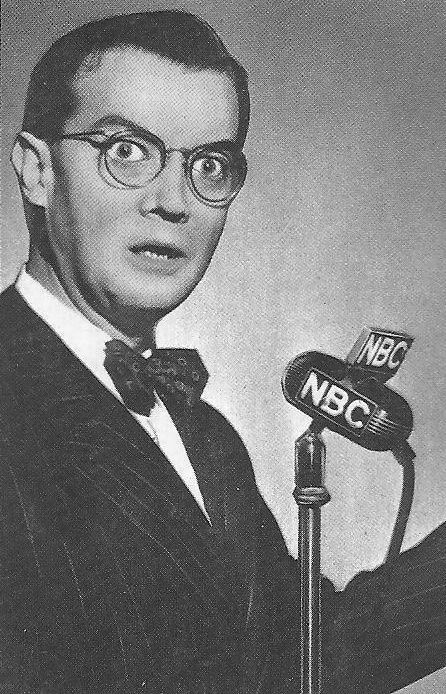 The 1940s would find Joseph Kearns at his busiest. He had a regular weekly appointment on “radio’s outstanding theatre of thrills” in the early broadcast years of Suspense as the show’s unofficial host, “The Man in Black.” Even after Joe turned in his somber clothing, nary a Suspense broadcast aired where he wasn’t playing a role in some capacity, and he continued to be heard on the show throughout the 1950s. Kearns would revisit his “Man in Black” persona by playing The Whistler in that series’ early broadcasts. Joseph made the rounds on many of the major anthology programs in that era, notably The Cavalcade of America, The Clock, Favorite Story, The Ford Theatre, The Gulf/Lady Esther Screen Guild Theatre, Hallmark Playhouse, Hollywood Star Time, Mystery in the Air, The Philip Morris Playhouse, Screen Directors’ Playhouse, The Theatre Guild on the Air, and The Theatre of Famous Radio Players. 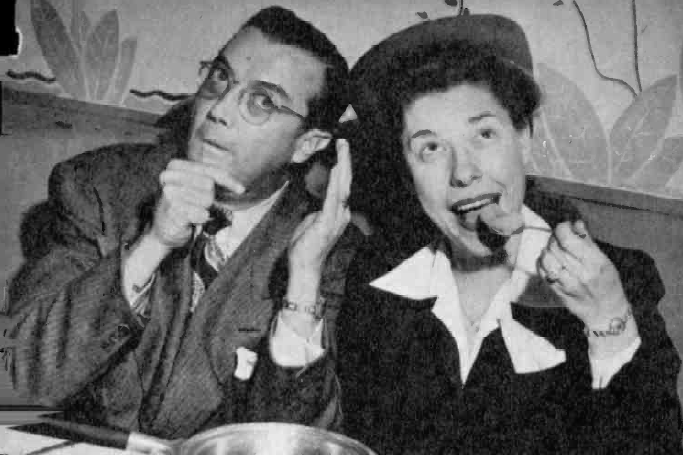 Joseph Kearns had certainly earned his dramatic chops…but he demonstrated a knack for comedy acting as well. He played Melvin Foster, the father of the titular teen on A Date with Judy in the program’s early years. 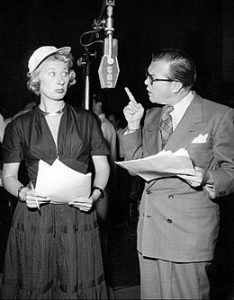 On The Mel Blanc Show, he was the star’s would-be father-in-law, convinced that his daughter Betty could do much, much better. Kearns played a variety of roles on The Judy Canova Show (notably as the eccentric Benchley Botsford), and worked on shows headlined by George Burns & Gracie Allen, Rudy Vallee, and Joan Davis (as “Pops” on Leave It to Joan). 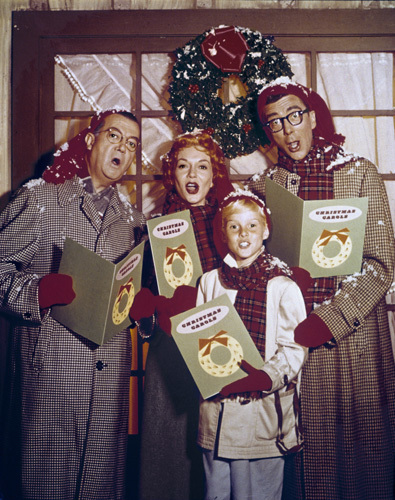 Joseph was a member-in-good-standing of the stock company on The Jack Benny Program, where he famously played Ed, the poor soul who had the unenviable job of guarding the star’s money-filled vault. (It was intimated that Ed had been in Jack’s vault for so long that he had very little knowledge of 20th century culture.) 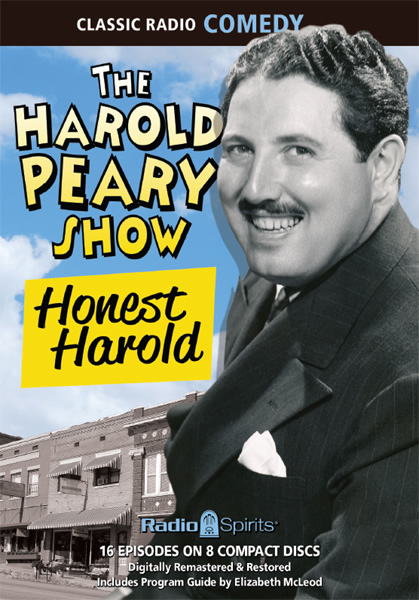 Joe also appeared on such favorites as The Adventures of Ozzie & Harriet, A Day in the Life of Dennis Day, Fibber McGee & Molly, The Great Gildersleeve, The Life of Riley, and My Favorite Husband. Joseph Kearns also had the comic relief assignment on Let George Do It as Caleb, the elevator operator in the building where George Valentine received the “full details” of his assignments. Rounding out the actor’s radio resume in the 1940s are gigs with The Adventures of Sam Spade, Box 13, Broadway’s My Beat, The Count of Monte Cristo, Ellery Queen, Escape, Lights Out, Mayor of the Town, The New Adventures of Sherlock Holmes, The Railroad Hour, Richard Diamond, Private Detective, The Roy Rogers Show, and The Story of Dr. Kildare. 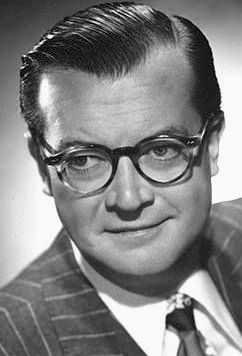 Joseph Kearns’ first film credit was 1951’s Hard, Fast and Beautiful...although if you’re a sharp-eared listener, you can hear Joe’s voice on the radio in the 1947 feature The Hucksters. The actor had another recognizable vocal gig in 1951, as The Doorknob in Walt Disney’s Alice in Wonderland. Throughout the 1950s, Kearns appeared in such movies as Daddy Long Legs (1955), Storm Center (1956), The Girl Most Likely (1957), The Gift of Love (1958), and Anatomy of a Murder (1959). Joseph was probably better known for his extensive work on the small screen; he made the transition to Jack Benny’s TV show and the video version of Our Miss Brooks (reprising his radio role as school superintendent Edgar T. Stone). He also had regular roles and guest appearances on the likes of December Bride, The George Burns & Gracie Allen Show, I Love Lucy, How to Marry a Millionaire, and Professional Father. While juggling movies and TV, Joseph Kearns kept up with his hectic radio pace—appearing on such shows as Amos ‘n’ Andy, Crime Classics, Family Theatre, The General Electric Theatre, The Hallmark Hall of Fame, The Halls of Ivy, The Harold Peary Show (as Doc “Yak-Yak” Yancy), Life with Luigi, The Line-Up, Mr. President, On Stage, The Phil Harris-Alice Faye Show, Presenting Charles Boyer, Pursuit, Rogers of the Gazette, Romance, and Tales of the Texas Rangers. Kearns was even around for many of the last great network radio dramas like The CBS Radio Workshop, Fort Laramie, Frontier Gentleman, Gunsmoke, Have Gun – Will Travel, Luke Slaughter of Tombstone, and Yours Truly, Johnny Dollar. None of these acting gigs apparently interfered with the TV show for which Baby Boomers remember Joe best—Dennis the Menace, a sitcom based on Hank Ketcham’s popular comic strip. 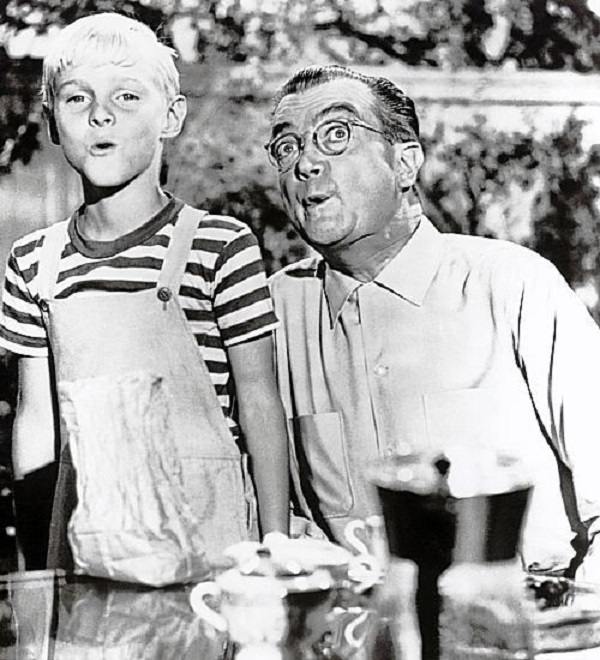 Though his role as fastidiously fussy neighbor George Wilson was originally going to be just a recurring one…the chemistry between Joe and star Jay North was unbeatable, and he continued as a regular until he was struck down by a cerebral hemorrhage in the series’ third season at the age of 55. What an in depth & fascinating bio!! Man, that guy was into EVERYTHING!! What an amazing career. Thanks for posting it! One of my favorite radio actors, so talented. Another fantastic job — where do you find this background info? You must have been a good gumshoe in a prior life; if i could, I’d marry your work here with Annette’s Hometowns of Hollywood and you’d make sweet, enticing music together! (that’s a plug for 2 of my favourite blogsters, y’know! )… Keep up the great work. Dan, I cannot take too much credit for the background info. That field was plowed by Radio Spirits’ own historian Elizabeth McLeod, who wrote an amazing article on Joe Kearns that you can find here. I just repackaged some of the information with some supplementary sources. But thanks for the Annette proposal! « Happy Birthday, Chester Lauck!